This is really scary. I can see through cracks in the floor boards to the steeply pitched rails beneath the little car in which I am riding. What if it should cut loose, plunge off the side or hurtle me to the bottom? Ahhh. 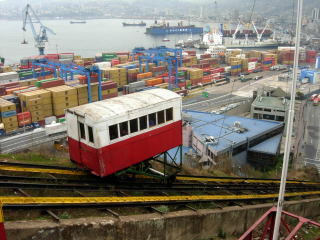 It reaches the top, the door opens, and I head out for a magnificent view of the harbor of Valparaiso, once Chile’s greatest port. The harbor looks busy, but its heyday was long ago. The opening of the Panama Canal put an end to the long voyage around the tip of South America, diverting ships far north of Valparaiso. Although named a UNESCO World Heritage Site, this historic and picturesque city plays second fiddle to glamorous Vina del Mar next door. Tour groups go there for lunch after catching a few highlights of Valpo. 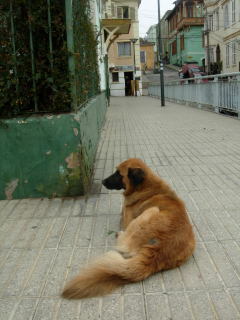 In order to see more, I have avoided the tours and taken an early morning bus from Santiago. 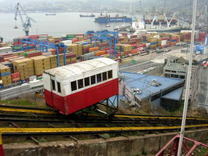 My goal is to ride the historic ascensores (funiculars) that climb the dramatic hills upon which the city is built. Constructed in the 19th and early 20th centuries, the ascensores are lovingly tended and, I presume, safe. More than a dozen still operate. The one I’ve just ridden goes up Cerro Artilleria (cerro means hill). At the top, stalls sell tourist trinkets. 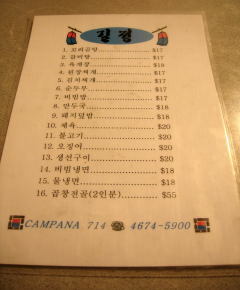 A single restaurant has posted its lunch menu. And history buffs hike further to the Museo Naval y Maritimo (naval and maritime museum). Another 250 pesos takes me down, and I board a bus to Ascensor Concepcion. “Tell the driver you want to go to Turri,” advises a woman at the bus stop, because that is the local name. This hill seems even steeper, but the trip is mercifully short. Cerro Concepcion offers a cluster of inns, restaurants and cafes and a long walkway with benches where one can relax and enjoy the view. Still, I have been warned not to wander heedlessly, and I avoid an empty street where I see an individual I don’t trust. Other tourists tell me that residents have directed them away from questionable areas and advised them to keep cameras hidden. Down below, I skirted two drunks as I headed toward a bus stop. Downtown seems run down, and the houses that I have seen in the hills look flimsy and weathered, like homes perched above the ravines in Tijuana. For lunch, I go to Café Turri on Cerro Concepcion, near the funicular terminal. This restaurant is in another world from what I have seen. Modern, airy and upscale, it could well be on a hill in San Francisco or in an exclusive part of Santa Barbara. View windows look out to a broad terrace and the sea beyond, but it is too cold to sit outside, although other tourists clamor for these tables. Lunch is elegant. Fish (reineta) has a creamy seafood sauce that incorporates oysters, shrimp, mussels and razor clams. 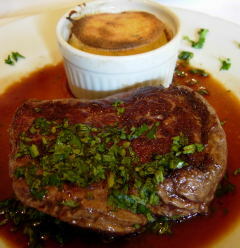 The potato gratin that the waiter suggests is just right with this. I ask for a red wine, and he brings De Martino Legada Reserva Carmenere 2006 from the Maipo Valley. Dessert is a Chilean classic, mote con huesillo , or cooked wheat with whole preserved peaches. In this upscale rendition, it becomes Vanidad Porteno (portenos are inhabitants of this port city) and is paired with a glass of late harvest wine, Casa Silva Semillon Gewurztraminer 2006 from the Colchagua Valley. Another 250 pesos, and I am back down, map in hand, walking to an ascensor nearby. But I get lost in the warren of twisting streets and never find it. Instead, I come across an artisanal fair and buy a jar of merquen, a spicy red pepper seasoning that originated with the indigenous Mapuches of the so uth. 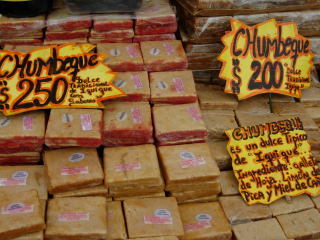 Another booth has chumbeque, a traditional sweet from Iquique made of flaky cookies blended with lime juice and cane syrup. 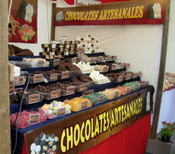 And another has fancy handmade chocolates. Continuing on, I see grand, faded, European style buildings from Valparaiso’s glory days. 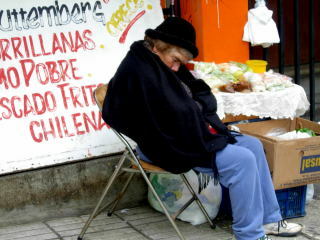 A market street is congested—produce stalls, bakeries, empanada shops and a woman nodding in a chair beside a table of goods for sale. Farther on is a line of stalls aimed at local trade, piled with alpaca scarves and caps for the cold weather to come, cheap jewelry, snacks and, although it is May (autumn in Chile), nativity scenes from Peru. 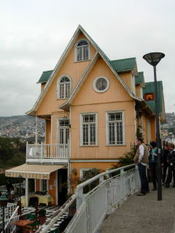 A bus takes me on a swirling ride around the hills, passing a sign for La Sebastiana, the house of the poet Pablo Neruda, which is now a museum. I visited the house on a previous trip, so I don’t get off. On that trip, I stopped o nly long enough to see La Sebastiana and to have a quick coffee at a famous café of the past, Café Riquet (now closed). One of its customers was the Chilean military dictator Augusto Pinochet, or so a taxi driver told me. Pinochet was born in Valparaiso. This time, instead of rushing in and out, I have wandered for many hours. Walking to the bus stop, I pass a pet food shop with hungry mutts clustered outside, modest lunch rooms and a bakery where frosting flows over cakes like folds of fabric. Near the Parque Italia, a tree-lined square, I see a lively stall that sells obleas colombianas, and I buy one for the trip home. 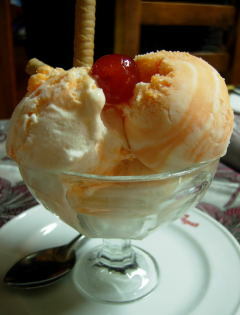 The tissue-thin wafers (obleas) are put together with arequipa, which is luscious, soft, Colombian style milk caramel. 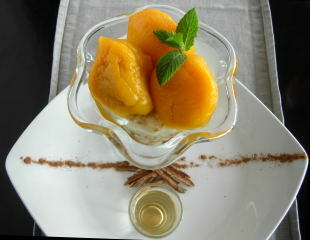 It is a sweet finish to an interesting day, and in only an hour and a half, I am back in Santiago. Tur-Bus goes every 15 minutes from Santiago to Valparaiso. Buses are comfortable and seats are reserved. The ticket office in Santiago is inside the Universidad de Santiago Metro terminal. A round trip ticket costs about $8. The O microbus will take you around the hills of Valparaiso, affording good views of the harbor if you sit on the right. Board this bus on Francia just past Colon, above Parque Italia. 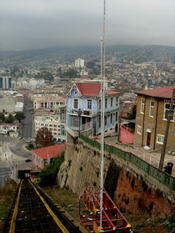 Ascensor rides are 250 pesos each way. Go armed with a map, a guidebook and enough Spanish to ask directions. Going to Donde Augusto is like stepping into a carnival where raucous barkers try to collar you for every sort of attraction. 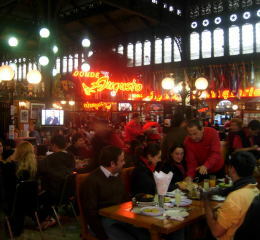 This restaurant is in Santiago’s Mercado Central, which houses a lively fish market, an abundance of cafes, produce displays, spice sellers and much more. The building alone is worth the trip for architecture buffs. They can inspect an airy wought iron superstructure that dates from the 19th century. Inside, prospective customers face a barrage of invitations to buy. It would be nice to take home some of this glorious seafood—fresh scallops on the half shell, mussels, oysters, clams a nd fish such as corvina and dorado. 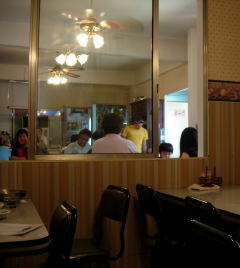 But we kitchenless travelers can only admire, then head for one of the cafes to eat our fill. Donde Augusto is the best known and most touristy, but I always eat there, because it has a balcony, from which I can look down on strolling musicians, families assembling at tables on the ground floor, waiters juggling trays of food, colorful heaps of fruits and vegetables, and a nonstop swirl of shoppers. I always start with the same dish—locos with mayonnaise and potato salad. Locos are often confused with abalone, so it seems like a bargain when you get two thick, tender, sweet chunks of this pale shellfish for about $15. However, locos are totally different. 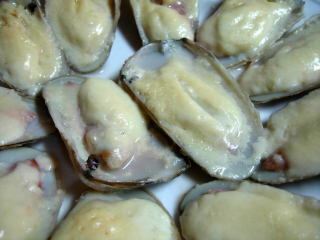 They are carnivores, whereas abalones are herbivores. Wild harvested deep off the coasts of Chile and Peru, where they cling to rocks and subsist on sea life, they consist of a single shell with tempting, delicious flesh. 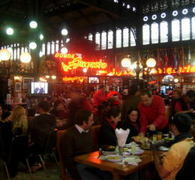 Waiting for the locos, I have a pisco sour, the most popular drink in Chile as well as in Peru. 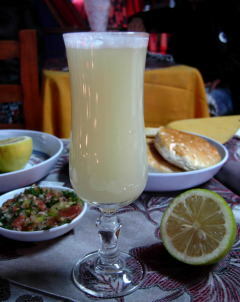 The waiter, who is Chilean, confesses that he thinks pisco sours are tastier in Peru, but this one is good enough for me. To accompany the cocktail, there are salty, flat, glazed rolls called hallullas and fresh salsa, the pebre to which Chileans are addicted. The locos plate is a good advertisement for Chilean produce as well as seafood. The butter lettuce leaves are springy and super fresh. So is the tomato slice. And the potato salad is light and well made, dressed with the same intensely yellow mayonnaise as the locos. When seafood is this good, I can’t stop at one dish, and so I order machas parmesana—razor clams on the half shell with creamy Parmesan topping. Twelve half shells seem a lot, but they are gone in a flash. For dessert, I want something cool and refreshing, like helado de chirimoya—cherimoya ice cream. Marbled with orange sherbet, the ice cream is a good choice, and I spoon it up slowly so that I can spend a few more moments drinking in the vibrant scene below. Donde Augusto, Mercado Central Local 66/166, Santiago, Chile. Tel: (56-2) 672-2829. To get there, take Line 2 of the Metro to Puente Cal y Canto. As you emerge from the terminal, you will face the large building that houses the Mercado. It is raining in Santiago, and I am coming down with a cold. What I need for dinner is chicken soup. And there is one restaurant that I am sure will have it. 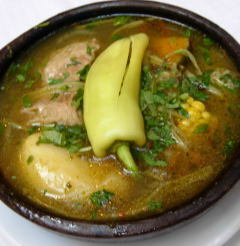 So I head for Galindo, which is known for such typical Chilean dishes as cazuela, a hearty meat and vegetable soup. 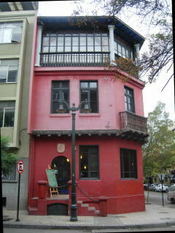 Galindo is in Barrio Bellavista, a bohemian, trendy, touristy neighborhood. It is near my hotel, and I walk there despite the gusts of wind that make my umbrella useless. Ah good, one of the dishes listed on the board outside is cazuela de ave—chicken soup. Inside, the restaurant is crowded, but a table by the window is free, and it is a nice spot, where I can look out on lamp light flickering in the trees that line the dark street. Everyone else is looking at me, or so I think until I discover that a soccer game is in full swing on the TV set over my head. I order a pisco sour, because the lime juice in the drink should help get rid of the cold. The cazuela arrives in a brown pottery bowl. It is magnificent, a very fresh, tender chicken leg surrounded by chunks of corn, yellow squash, potato and rice in delicious broth. The long green strands over the top are green beans. The waiter provides a plate so that I can lift the chicken out and cut the meat from the bones more easily than in a sloshing soup bowl. I put the chunks back and stir in a spoonful of pebre, a zesty Chilean salsa, to make the soup even more flavorful. All is well until I experience a breathless, choking sensation. It isn’t the cold but smoke drifting from the tables around me. Then I see a sign that says the room is a “zona de fumadores” (smoking zone). When I ask to move to the no-smoking section, I learn there is none. The entire restaurant is a tobacco zone. Except for the unwelcome fumes, I’ve had a good dinner, though. And I walk out into the cool, fresh, rain-washed night air, smoke-free and feeling much better. Galindo, Dardinac 098, Barrio Bellavista, Santiago, Chile. Tel: (56-2) 777-0116. A fascinating part of Chile’s history is the arrival of German settlers in the second half of the 19th century. The newcomers introduced beer, sausages, breads and delicious pastries, one of which met with such wide acceptance that it crossed over into Chilean cuisine. Kuchen (cake) is the only German food word that has been adopted without alteration by Chileans. You don’t have to seek out German restaurants or go south to find it. Cafes anywhere may have it, just as scones and Danish turn up at coffee shops in the United States. The most common is apple kuchen, topped with a lattice crust, a glaze or migas, a crumb mixture similar to streusel. When I walked into Café El Observatorio in Santiago one morning, I found on the menu “kuchen de manzanas con miga streusel” (apple cake topped with crumbs), identified as a “receta alemana” (German recipe). A slice with coffee was perfect for a mid-morning break, just as German housewives might have served it. Juicy diced apples with a scattering of raisins sat on a tender crust under a layer of sugary crumbs, not the nut streusel that is common in the United States. Interestingly, Barrio Lastarria, where Café El Observatorio is located, dates its earliest construction to about the same time the Germans set sail for Chile. Quietly bohemian and seriously cultural, the barrio is populated with artisan shops, fashion boutiques, antiquarian bookstores, interesting restaurants, cafes, bars and the like. Café El Observatorio occupies a corner of a century-old house that functions as a cultural center. It is peaceful to sit there overlooking the tree-lined main street, Jose Victorino Lastarria, which was named for a 19th center intellectual, revolutionary and political figure. 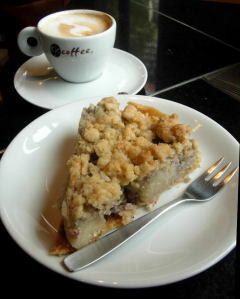 The café also has a nut kuchen with caramel that I haven't yet tasted, so I’ll be back for sure next trip. 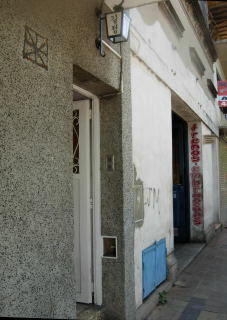 Café El Observatorio, Villavicencio 395, corner Jose Victorino Lastarria. Tel: (56-2) 632-4588. Open 8:30 a.m. to 1 p.m. Monday through Friday; 10 a.m. to 10 p.m. Saturday and Sunday. A Threat to Chile's Vineyards? It's a sad and all too common story, prime agricultural land being sold for hous ing. And it’s happening to the vineyards around Vina Quebrada de Macul in Chile. This winery produces Domus Aurea, an iconic, high-priced Cabernet Sauvignon destined primarily for export. The winery is small, and the land around it is beautiful. The area is the Alto-Maipo Valley in the commune of Penalolen, far enough outside Santiago and high enough so that one can see the brown layer of pollution that clouds the city. 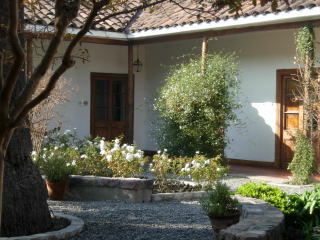 The terrain rises to a spectacular view of the Andes, snow-capped all year. No wonder people want to live here. For now, at least, Vina Quebrada will retain its 26 hectares (about 64 acres) of vineyards, which yield the grapes for Domus and two other premium reds, Alba de Domus and Stella Aurea. The only other wineries that remain in what is one of the oldest vineyard areas in Chile are Aquitania and Cousino Macul. Forty years ago, the grandfather of Ricardo Pena, the attorney who owns Vina Quebrada, bought the land from Cousino Macul, planted food crops and reverted to grapes when those did not do well. The winery building is small and not open for touring. “We put our money into wine, not into something to impress people,” says wine consultant Rodolphe Bourdeau, who offered to guide me through the property (he is at right in the photo above). And so there is no tasting room, no place to buy the wines. Before entering the winery, we look at the 16 hectares that are devoted to Cabernet Sauvignon. 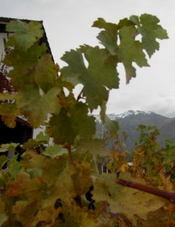 The vines, leaves turning yellow now, were planted in the early 1970s. The remaining 10 hectares include Merlot, Cabernet Franc, Petit Verdot and more Cabernet Sauvignon. The soil is littered with stones washed down from the Andes. The roots of the vines go very deep so that little irrigation is needed, Bourdeau says. Despite the poor soil, the Cabernets from this area rank among Chile's finest. Temperatures during harvest can be very cold at night, hot during the day. This year, the harvest was late and long, ending just two days before my visit well after the middle of May. 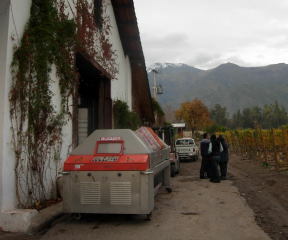 Winery workers stand in clusters, relaxing for a moment now that the intense work of harvest and crush is over. A vineyard block is divided into five areas that are divided again into thirds according to altitude. Even a slight rise in the land makes a difference, Bourdeau says. To me, the rise is barely perceptible. We go inside to taste the makings of Domus from stainless steel tanks and French oak barrels. “Many times when we bottle this wine, we are a little bit scared, but after one and a half years in the bottle, it develops,” says Bourdeau. The wine maker is Jean-Pascal Lacaze. One of the young Cabernets that I taste from a tank is impressive, beautiful. Bourdeau calls it “the soul of 2008.” And he enthuses about the sensations of black currants, mint, balsamic, eucalyptus and fresh and brilliant fruits. It is so good that I wish we could pull up a table and sit down to a lunch of cheeses, bread and this wine, which will eventually go into a blend. For Domus, Cabernet Sauvignon is blended with small amounts of other varietals. Depending upon the vintage, these could include Merlot, Cabernet Franc and Petit Verdot. "This place has a very strong p ersonality. In a blind tasting, it is almost impossible not to recognize it,” Bourdeau says. I’m not sure that I’ll ever taste Domus, because none of the wine shops in my vicinity have it, although there are distributors in the United States. 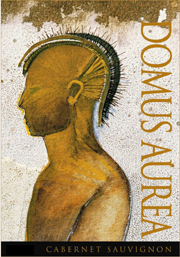 The latest release, 2006, consists of only 3,000 cases, less for Alba de Domus, and still less for Stella Aurea. And the company exports to 30 countries. Only 5 per cent remains in Chile. A fourth label, Vina Penalolen is a smoother, easy-to-drink wine made from purchased grapes as well as those from the property. It is more widely available and moderately priced, around $15. As soon as I return to Santiago I have to catch my flight home, so I can’t go to the shops where Bourdeau says I might find Domus. However, I do leave with a souvenir—two very small Andean stones that I found among the Cabernet vines—a much nicer memento than another T-shirt, engraved wine glass or logo bottle opener. 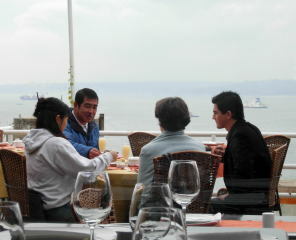 Confiteria Torres in Santiago takes pride in the famous people who have eaten there. One of them was Ramon Barros Luco, president of Chile from 1910 to 1915. Barros Luco was so fond of a hot beef and cheese sandwich that he ordered it on every visit. That sandwich is still on the menu, singled out so that tourists can’t miss it. But I’ve overdosed on cheese in cafes and pizzerias in Buenos Aires, and I want something else. 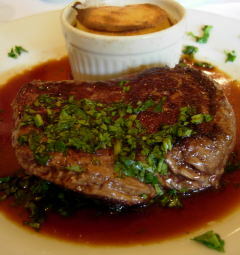 The waiter says filete al cilantro is very good, and I choose that instead. The filete (steak) is marinated for 12 hours with cilantro, spices and olive oil. Then it is grilled and served with chopped cilantro on top and a rich brown sauce. The meat is chewy and delicious. 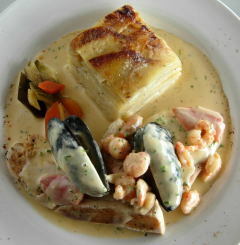 And I love the side dish, pastel de chuchoca. More like a creamy soufflé than a cake (pastel), it has a warm, savory corn taste because it is made with chuchoca, cooked corn that has been dried and ground. 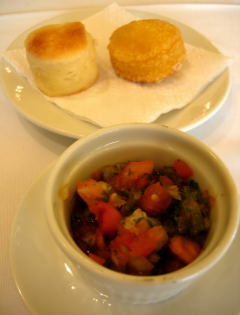 Pebre, that ubiquitous Chilean tomato salsa, is on the table, along with tender little yellow rolls (sopaipillas) made with squash. 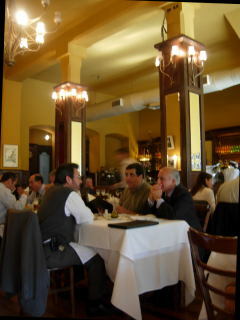 The businessmen lunching around me are drinking pisco sours, but I ask for a glass of 2006 Carmenere from Vina Ventisquero. The waiter suggests that I go downstairs to see the private dining area next to the wine cave. The design is modern and minimalist, but the charm of Confiteria Torres is its age and history. Opened in 1879, it became a gathering spot for high society, intellectuals, artists, politicos, musicians and writers , including Chile’s illustrious poet, Pablo Neruda. 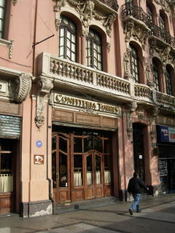 The confiteria was named for Jose Domingo Torres, who cooked for an aristocratic family in Santiago. So great was the demand for his skills that the family established this business for him. The confiteria moved from its original location in the early 20th century. As the neighborhood declined, business fell off, and in 2002, it was closed. Then a new owner took over and refurbished the premises. Today the confiteria is a mix of old and new. The rococo pink façade is antique. The old oak bar remains. And the menu offers traditional Chilean dishes. Filete al cilantro is one of them. 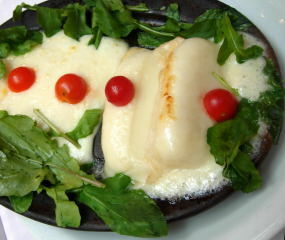 After the steak, I order huevos chimbos, “the most famous of old Chilean desserts," the menu says. It is a charming dish of light, eggy, yellow cakes studded with almonds and placed in clear syrup along with a mound of whipped cream. The perfect finish is a bracing café cortado—strong coffee foamy with milk, and a nice change from Nescafe, which has long been the coffee of choice in Chile. Confiteria Torres, Avenida Libertador Bernardo O’Higgins 1570, Santiago, Chile. (This broad street is also known as the Alameda.) Tel: (56-2) 688-0751. Open Monday through Saturday "all day," according to the restaurant’s card. 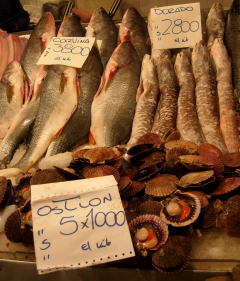 I feel a twinge of familiarity as I walk into Liguria in Santiago. And a little confusion. I left Buenos Aires less than two days before, but I seem to be there again. Carlos Gardel is singing tango. 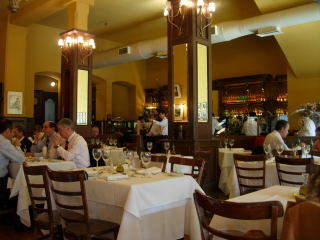 And the bar looks like any respectable café in Buenos Aires, comfortable, convivial, a bit antique. Opening off the bar is a dining room decorated with vintage signs. 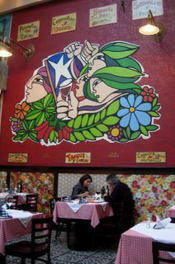 A wildly-colored mural covers the wall at one end of the room. 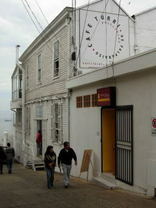 At the bottom, a sign says “tangos, cuecas.” And the tango beat goes on. 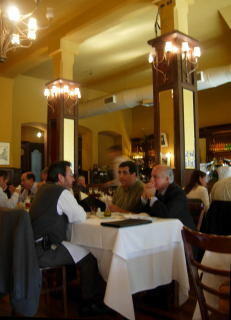 The menu offers dishes that are common in Buenos Aires (grilled meats, provoleta), but also traditional Chilean food, and I order arrollado huaso, a pork roll named for the Chilean cowboy. This is certainly cowboy fare, meaty and heavy. 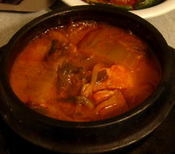 The marinated pork has been rolled tightly, wrapped in pigskin and simmered in water and wine. It comes with delicious fried potatoes sprinkled with merquen, a hot red pepper seasoning from southern Chile. My companion has beef cazuela, which is just as hearty. The large bowl contains a dense chunk of beef along with a whole potato, corn cob chunks, squash, green beans and rice, submerged in broth. A large, pale chile stretches across the top. The red-checked tablecloths and rustic setting seem just right for dishes like these. Neither one of us can finish, because we started with a platter of melted goat cheese and arugula that was too good not to finish. Chilean goat cheese is mild, mellow and creamy, not strong like the goat cheeses I am accustomed to at home. Our bread basket includes golden sopaipaillas, made with pumpkin. In Chile these are eaten along with meals or as a dessert, with syrup. 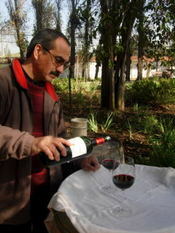 The wine we select is El Bosque Winemaker’s Choice Cabernet Sauvignon 2005 from Vina Casablanca. I like the label, which shows a tree bent by the wind. Unwisely, we order two desserts. One is leche asada, a custard baked in caramel. 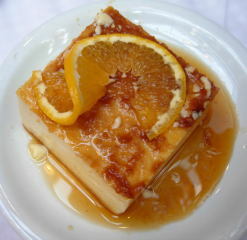 It has been cut in a square and topped with an orange slice, which imparts a lovely, delicate flavor. I eat so much that I can’t manage more than a forkful of a luscious tres leches cake, billowing with meringue. Only a huaso-style appetite could have handled that. 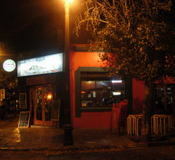 Liguria Bar-Restaurant, Providencia 1373, Santiago, Chile. Tel: (56-2) 235-7914. Not to worry. Even if you have only a day or two, it is possible to visit a top Chilean winery, tour its spacious grounds and historic wine caves, sip a glass or two of wine and be back in Santiago in time for lunch--or to catch a plane to your next destination. That is, if you take the 10 a.m. tour at Santa Carolina Winery, as I did. For late sleepers, there are tours at 12:30, 3 and 4:30 p.m. The tour lasts an hour, but you can linger in the brand new tasting room, which was completed in early 2008. Most wineries are located in farflung valleys, but Santa Carolina is right in town. Line 5 of the Metro takes you to the stop Rodrigo de Araya. From there, it’s a three-block walk. Your tour group will assemble in a room where historic wine bottles are on display, including the only two left of a special bottling in honor of Pope John Paul II’s visit to Chile in 1987. The labels show the papal insignia. Then you’ll pass by a room of stainless steel fermentation tanks and head outdoors to see the old chapel, constructed in 1875, when roof tiles were molded over human thighs. The chapel, and the country house where winery workers once lived, are now offices. The national flower of Chile, copihue, grows in the courtyard of this old building. Although its habitat is the far south, the plant has survived in this location. 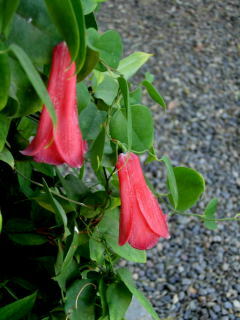 A red copihue was in bloom when I was there in M ay. A broad park used for weddings and other events includes one example of a Chilean palm that yields honey. 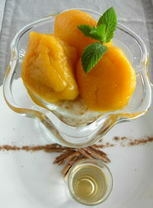 My guide, Macarena Moya, explained that a popular dessert in Chile is bananas topped with this miel de palma. The honey comes in cans small enough to take home as a souvenir. I picked one up at a Lider supermarket. But I’m here to taste wine, not honey. And here it is, a bottle and glasses set out on a wine barrel beside the walkway. The wine is Santa Carolina Barrica Selection Carmenere 2006, produced from grapes from the Rapel Valley. There are no vineyards at this site. Only in Chile does Carmenere grow on its own roots, Moya says proudly. In Europe, phylloxera wiped out grape vines in the late 1800s, and new cuttings had to be planted on resistant Amer ican root stock. Now we are heading into the warehouse and wine caves. Built over a 21-year period starting in 1877, they were named a national monument in 1973. To comply with that honor, worn-out flooring had to be replaced with an exact replica of the original. We see huge fudres, tanks of Chilean oak in which wines were fermented before the era of temperature-controlled stainless steel tanks and smaller lots of wine. 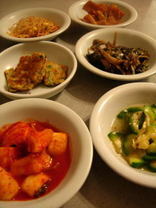 A few are still in use, but only to ferment yo ung wines for cooking. 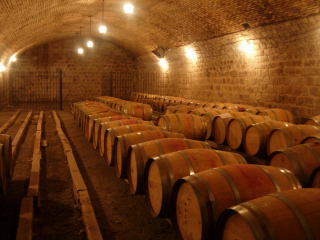 Now, wines are aged in French oak barrels in beautifully-arched and illuminated underground caves, designed to resist earthquakes. The oldest part was built by a technique known as cal y canto, bricks put together with egg whites and lime. 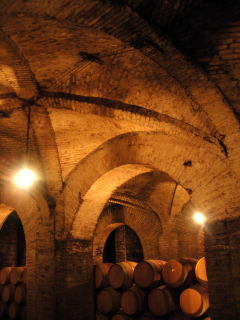 Wines reserved for the original owners were stored behind a railing at one end of a long corridor. The founder, Luis Pereira Cotapos, brought enologists from France and commissioned a French architect to design the imposing warehouse. The winery was named for his wife, Carolina Iniguez Vicuna. Our tour ends in the new tasting room, where I am poured a glass of Santa Carolina Reserva de Familia Cabernet Sauvignon 2005. 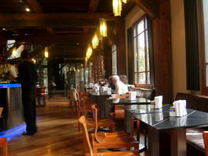 The room is spacious and comfortable, with places to relax. A large screen is there for a slide show, the finale of a tour for architectural students conducted by the architect who handled the recent restoration project. Not only were the premises revamped, the wine labels have also been redesigned. Santa Carolina is now part of a large agroindustrial group, Watt’s S.A., which produces processed foods and beverages. Carolina Wine Brands is the new name for the wine operation, which has an office in Charleston. South Carolina. Perhaps this will make it easier to locate the wines in the United States. 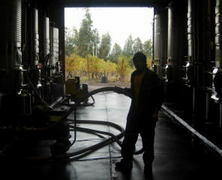 The sixth largest wine producer in Chile in terms of exports, Carolina Wine Brands has five lines. 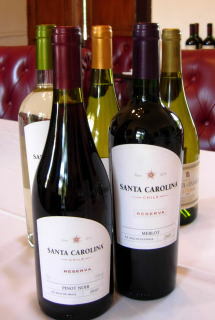 The oldest is Santa Carolina, which ranges from varietals to icon wines. Vina Casablanca is a boutique line from the Casablanca Valley. Antares is aimed at a young market. Vina Ochagavia wines range from varietals to grand reserve wines. This line is named for Silvestre Ochagavia, who founded his namesake winery in 1851 and is considered the father of Chilean viticulture. Finca el Origen produces Malbec and other varietals at a property in Mendoza, Argentina. 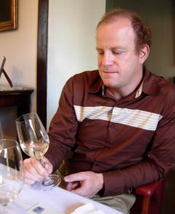 Head winemaker Sven Bruchfeld studied at UC Davis in California as well as the prestigious Universidad Catolica in Santiago. Once a month he takes the 30-minute flight to Mendoza to oversee winemaking operations there. Fortunately, he is in town, and I meet up with him for a tasting before I leave. We sample wines from the Santa Carolina and Casablanca lines, including the intense Reserva de Familia Carmenere 2006, which spent a year or so in barrels. Although Carmenere is Chile’s signature wine, Chileans buy mostly Cabernet Sauvignon, Bruchfeld says. 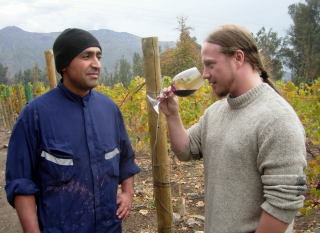 “In Chile, Carmenere is very good, but other varietals are also good,” he adds. Bruchfeld himself is partial to Syrah. When I ask what these wines will sell for in the United States, I am amazed at the low prices. Even the top of the line icon wine, VSC, a Cabernet Sauvignon blend, will cost only about $25. I figured that shipping such a long distance would be expensive, but that is not the case. “Shipping costs nothing,” Bruchfeld says. And I determine to seek out these wines when I go home. Bruchfeld has a meeting now, so our tasting of a dozen wines ends, and I head back to lunch in Santiago. Tours are offered Monday through Friday at 10 a.m., 12:30, 3 and 4:30 p.m. Saturday tours take place at 10 a.m. and 12:30 p.m. The winery is closed Sundays. The basic tour is about $15, and includes tastings of two reserve wines. The icon tour, at approximately $33 (the exact amounts depend upon currency exchange rates), includes tasting of two premium wines and one icon wine. To schedule a tour, go to the web site, http://www.santacarolina.com, and click on “contact,” then click on “tours” in the subject box. The address is Vina Santa Carolina, Rodrigo de Araya 1431, Macul, Santiago, Chile. The telephone is (56-2) 450-3000. From the top, pouring wine during the tour; the old country house, now offices; copihue in bloom, an underground wine cave; earthquake-proof arches; Santa Carolina wines; winemaker Sven Bruchfeld.